I love Chia pudding for breakfast, but it makes a great dessert. There are lots of recipes out there that add sweetener to the pudding but I feel that the pineapple and coconut adds just the right amount of sweetness in this recipe, but feel free to add your favorite sweetener to the Chia pudding mixture. The coconut yogurt I use is plain and unsweetened you can substitute vanilla coconut yogurt if you like. Place milk, yogurt and chia seeds in a mason jar. Shake jar so there are no clumps and the chia seeds are mixed in. Leave in fridge over night until thickened. If you don’t have time to leave overnight chia pudding should have thickened in 2-4 hours. I like to leave over night so flavours mingle. Chop ½ the pineapple into small pieces; reserve the other half and slice into rings for topping the pudding. Here you have 2 choices you can place chopped pineapple in blender to puree or you can crush the pineapple with a potato masher. I like it pureed. Layer pineapple puree or crushed pineapple in bottom of glass or jars. 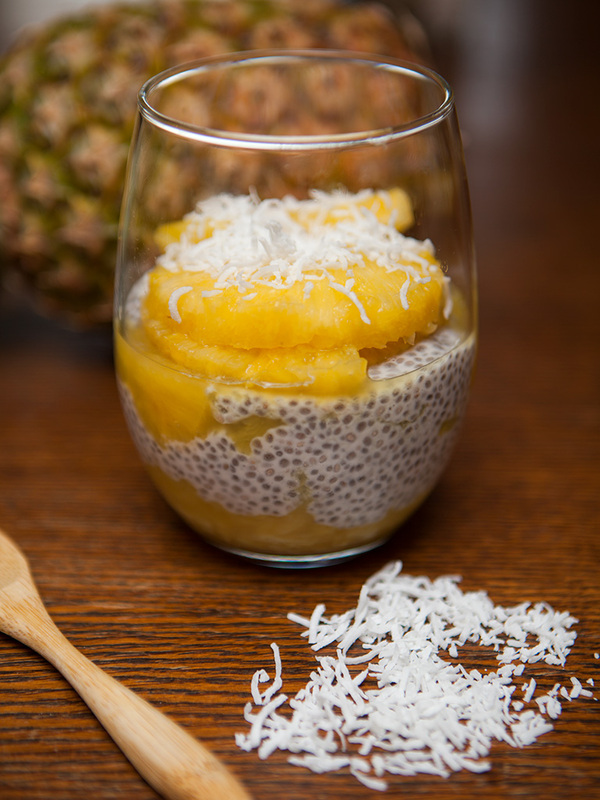 Then layer chia pudding on top, continue another layer with pineapple and chia pudding. Place 2 pineapple rings on top of chia pudding with the shredded coconut.